In my last entry, I issued a challenge to search, look for, explore, discover,FIND 10,000 reasons to thank and praise God for before you meet Him face to face – at which time you will have no trouble finding innumerable reasons. But I mentioned a garden and I thought I’d share a real picture, versus a figurative one, of how a garden of praise can overtake parched or stubborn ground. 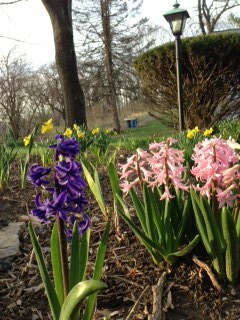 In the last photo, you remember there was a lone hyacinth. Now, look. Praise is spreading. Spring is the best time to start a Garden of Praise. Who knows what you could have by the end of your “season” here on earth? It was one of life’s “downer” moments. A mix of discouragement and sadness had gotten the upper hand of my morning so I stepped outside. 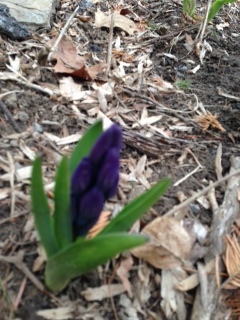 Fortunately for my soul, I walked by a little garden under our English yard lamp and happened to notice some Springtime hope in the form of a hyacinth so small I almost mistook it for a crocus. Something so small but so vibrantly spelling “life” saved more than my day. It has helped me turn a corner that repeatedly presents this question: Will I view life through the lens of thankfulness or will I allow the hard, harsh and often plaguing sorrows of life rule my mind, my moment-by-moment thoughts and attitudes and, in fact, my life? Continuing my walk, a fortuitous sense to check our apple trees led me to notice the delicate buds and remind me why lovers settle under the power of their allure. It dawned on me that life will always offer swirling or straightforward juxtapositions. This little walk happened to be an in-your-face proposition. I could ignore the obvious beauty and promises of April or I could allow them entrance. I decided to invite in the wonder of Spring. That led to other ongoing deliberate decisions over this past week which has led to a challenge for each of us. Momentum swings in wars and sports and so it must in our minds and hearts. We must muster up the courage to push our way into the positive by using definitive signs such as beauty to confirm that God ‘s love is worth fighting for and if we allow Him the room, He will push up through the hard ground in our souls like that hyacinth. The phrase “10,000” was used in hyperbolic way by speakers and writers back when “trillions” were not in the equation. And so it was that when songwriter John Newton penned “Amazing Grace” and wrote, “When we’ve been there 10,000 years,” he was speaking of some eternal measure. It is changing my life to become an explorer of God’s goodness, whether or not they coincide with pain. I used to think “10,000” was an exaggeration by romantic poets, but Charles Wesley was said to have written some 6,000 songs. He must have had a few hyacinths in his garden. I challenge you to keep a journal. Write as many thankful things as you can think of as quickly and as often as possible. You will soon find yourself scratching out a dozen, then two dozen, then 60 or more. Lewis Carroll wrote: “Why, sometimes I’ve believed as many as six impossible things before breakfast.” I loved that quote and I decided to change it up: “Why, sometimes, I’ve been thankful for more than sixty things before breakfast.” I actually did it. Sixty thankful items spilled onto my pages within minutes – no exaggeration. I was chasing the tail of 10,000 Reasons! Life can be like a stubborn yard, overgrown with limitless problems. It is up to us to take all of the beauty we can, uproot the weeds and plant some gardens and apple orchards and soon the momentum will shift to the beautiful and overtake and reduce, with our cooperative diligence, the swirling juxtaposition’s impositions by comparison. Someone once described a choreographer like this: he or she gives guidance, organization and purpose to a dancer’s movements. He or she is to the dancer what the songwriter is to the singer. Being a songwriter, I can tell you that the distance between the moon and the earth is nothing compared to the chasm between concept and performance. To mix some metaphors here, just ask an architect and a builder to agree on anything. So, perhaps I just witnessed either a miracle or a recital the way it was always meant to be. 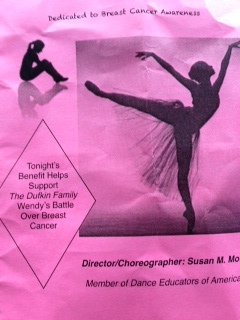 An upstate New York Christian ballet troupe decided to dedicate their big evening to one of the dancer’s mother who has been waging a courageous fight with breast cancer. Aptly entitled “The Glory Battle,” the program clearly demonstrated a unified spirit during the entire night from the baked sale to the huge pink donation box to the grace displayed during every dance. I happen to be a parent of one of the adult dancers. Most moms and dads can either chill and enjoy or bite their nails while praying that nothing embarrassing happens during their kid’s “moment.” Sure enough, like most recitals, there were some slight missteps, some more noticeable than others. But, that’s not what I saw at all. I saw beautiful teenagers and 20 and 30-somethings dancing their hearts out, gracefully weaving with steps and jumps that would make any parent proud. And I saw one other thing: these girls had each other’s backs, sometimes literally. 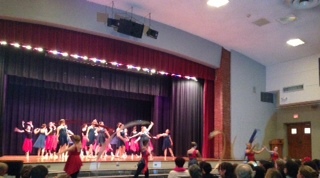 The troupe’s director, Susan Morse, does not develop competitors. She has managed to mold three generations of young ladies who have decided that the overall “concept” of Christian ballet is more important than individual agendas and star-making. The Glory Battle on behalf of this brave woman was fought with a grace of character that the photos below can’t adequately capture. Did I really just read that? This dude thinks we live in an “unkind world.” Well, what do you know? Obviously then, we are not the first persons to discover this uncomfortable truth. I thought someone might like to know that the antidote which immediately precedes this observation is still the cure. This is not opium for the masses. It’s a real remedy for the “now” and it’s nice to know you’re not the only one who needs to “escape” to Someone who knows how unkind this world can be – even to its own God. My two friends and I sat in the diner booth closest to the door so we wouldn’t have to walk too far. Food was not the only thing on the table. There was an obvious serving of conversation about our physical maladies, some of whom had the unfortunate fate of having much to much on their plates. I first noticed this “slowing down” thing (euphemism for aging) after questioning a personal friend who happened to be a physician. “You’re getting older,” he said. “But, but, but, I’m only in my thirties,” I said. He just raised his eyebrows. About a decade later, I went chasing after a loose ball on the basketball around mid court and my opponent beat me to it. That never used to happen. I was shocked. I was humiliated. I was…getting older. Now, another decade has passed. I more fully understand, but not as much as my friend across the table. 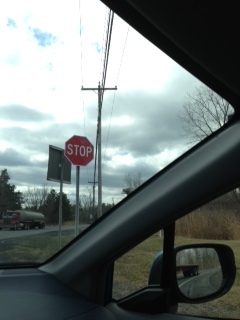 Returning from lunch, I pulled through a New York State Thruway tollbooth only to find that a “Yield” sign had been replaced by a “Stop” sign. I would now be forced to stop. To slow down. The obvious analogy made me sit up in my driver’s seat. It was the “Great Traffic Cop In The Sky” who was making my body come to some braking points as if to kindly tell me that speed limits aren’t always from the devil after all. I’ve worked with the aging population most of my life. These wise men and women often remind me that “getting older isn’t for cowards.” None of them knew they were referencing a profound scripture. I have often quoted to them what I’m now realizing is happening to me. God even made the translation to English rhyme so I would be able to memorize it a little easier. BELOW: (left) Even the cop stopped! 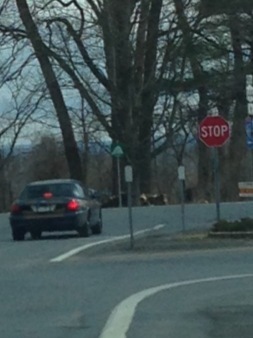 (right) Ugh, I have to “yield” to the Stop sign.